TFW: you realize your bright orange shirt *really* stood out at that tech conference... Thanks to everyone at #IndieWebSummit I learned so much and had a great time. So nice to be able to look back through #indiewebsummit posts in my own reader that's been collecting them over the last few days! Your final updates for IndieWeb Summit! Hello! Only a couple more days before we all come together for IndieWeb Summit! I am very much looking forward to the week, and I hope you all have a fantastic time while you're in Portland. Here are a few last details before we meet. You'll probably want to save this update so you can refer to it as you make your way to Portland for the festivities. 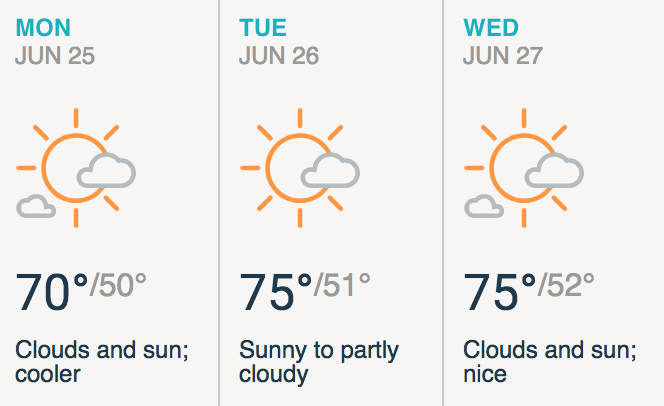 It looks like we'll have some pretty great weather, much less hot than last year! The forecast is showing a high of 75 and low of 50, with a chance of rain Monday morning and dry the rest of the week. I'm looking forward to sharing Portland's nice weather with you in contrast to last year's 100+ degree days! We will be providing bagels, fruit, and protein bars on Tuesday and Wednesday mornings thanks to GoDaddy. Coffee will be available all day thanks to Mozilla! Lunch on Wednesday will be provided at the venue thanks to Okta. We'll have a taco bar with gluten free, vegetarian and vegan options! Tuesday lunch will be on your own at any of the nearby food carts. On Monday evening, we'll be hosting a pre-party at Pine Street Market in downtown Portland starting at 5:30pm. We'll have drink tickets available thanks to Name.com, and anyone is welcome to come to the pre-party! Pine Street Market has a variety of food and drink options, including burgers and veggie burgers, ramen, pizzas, bratwursts and German pretzels as well as Salt & Straw ice cream, excellent coffee, smoothies and fantastic cocktails. 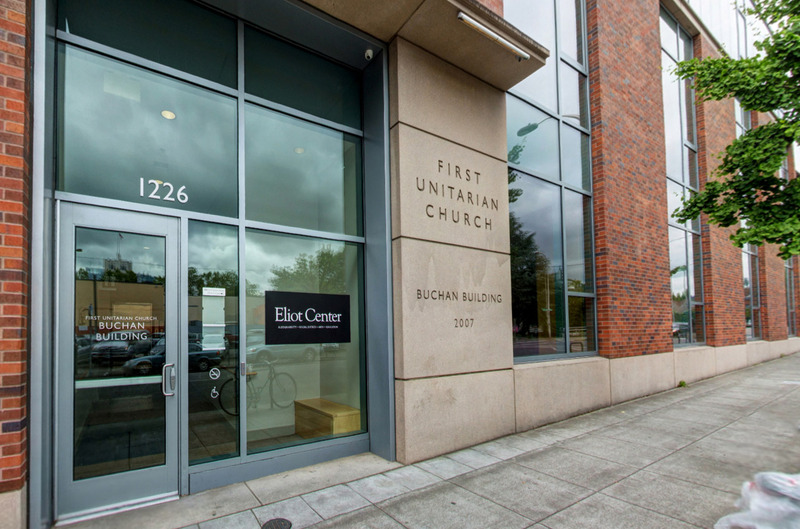 We'll be at the Eliot Center at 1126 SW Salmon St, in the Buchan Building. The doors open at 9:00am on Tuesday and Wednesday. Please note the entrance is on Salmon Street. If you enter from another street you'll be quickly lost inside the rest of the First Unitarian Church. The picture below shows what our entrance looks like. Look for either "1226", or "Buchan Building". We'll also have an IndieWeb Summit sign on the door. There is a streetcar that runs North/South along 10th and 11th Avenues that will drop off a couple blocks from the venue. TriMet runs the buses and light rail here. The cheapest way to get into town from the airport is to take the MAX red line which picks up at the airport and drops off at Pioneer Square downtown. It's $2.50 for a 2.5 hour ticket or $5 for an all-day ticket. If your phone supports Apple Pay or Google Pay, you can just tap your phone to buy a Tri-Met or Streetcar ticket using the "Hop" readers at every stop! It's by far the easiest option. Make sure you tap your phone at the stop before boarding. You don't need to tap out when you get off. Otherwise, you can use a credit card or cash to buy a ticket at most MAX and Streetcar stops. We will have people participating remotely who couldn't come to Portland this year! The main room will be set up for remote participation with cameras and screen sharing, and all the sessions will be recorded. The two breakout rooms will have a camera setup for remote participation as well. More information and the relevant links are on the wiki. Friday is the 10th and final year of Open Source Bridge. If you're still in town on Friday, this will be a great event to attend! You can read the Open Source Bridge blog for more details about what to expect. You will need to register separately for this event. If you haven't already, join our Slack room or IRC channel (they're connected) and introduce yourself! We'll be using the chat during the event to take notes, share links, and communicate with the remote participants. As a reminder, we have a Code of Conduct that applies to IndieWeb spaces both online and offline. I'd like to give a shout-out to our sponsors who make all of this possible! A huge thanks to GoDaddy, Name.com, Okta, Mozilla, and Bridgy, as well as our monthly supporters and everyone who contributed specifically for this event! Also special thanks to our venue sponsor Stumptown Syndicate. That's all for now! Looking forward to seeing everyone on Monday! You're Invited to IndieWeb Summit! IndieWeb Summit is soon, and is shaping up to be an exciting event! We're hosting IndieWeb Summit the same week as the (final) Open Source Bridge, in case you needed another reason to visit Portland! IndieWeb Summit will be Tuesday-Wednesday June 26-27th, with a pre-party the Monday evening before. If you're at all interested in taking back ownership of your online data, decentralizing the web, independent blogging, or any aspect of having a website, you should consider joining us for this event! It’s a really friendly, collaborative group of people and it is always inspiring to see what people are making. You don’t need to be a programmer! In fact, I would love to see more non-programmers attending. We need writers, graphic artists, designers, UX engineers, and anybody that wants to reclaim some of their online presence with a personal website. One of the distinguishing features of IndieWeb Summit compared to the IndieWebCamp events we run in many other cities throughout the year is we begin day 1 with a few keynote presentations to help set the stage for the two days. This year we're featuring a few special guests during the keynotes. Manton Reece will give a talk about how Micro.blog works with open standards to encourage people to own their data while also making a service that is incredibly fun and easy to use. William Hertling, the author of Kill Process, a book that features the IndieWeb, will talk about his inspiration for writing the book and where he sees the future of the IndieWeb heading. We've been seeing some exciting progress with IndieWeb readers over the last few months, between my reader Monocle, Eddie's iOS app "Indigenous", and Jonathan and Grant's app "Together". We'll be sharing the latest developments along that front as well! In addition to IndieWeb Summit, the whole week will be a great lineup of events! Wednesday, June 27th 9am-5:30pm - IndieWeb Summit Day 2 - Create, Hack, Demos! I hope to see you there! You can register now at 2018.indieweb.org! Good morning! Make yourself a nametag when you get in! Good morning #indieweb Summit! Looking forward to a packed day of demos and sessions and chatting with everyone! Hello! Only a couple more days before we all come together for IndieWeb Summit! I am very much looking forward to the weekend, and I hope you all have a fantastic time while you're in Portland. Our guest list is all full up! If you won't be able to make it this weekend, please reply to this message and let me know. That will free up some space for people on the waiting list. Here are a few last pieces of information before we meet. You'll probably want to save this update so you can refer to it as you make your way to Portland for the festivities. The good news is there's almost 0% chance it will rain this weekend. The bad news is it's going to be one of the hottest weekends of the year. The forecast is predicting a high of 95°F on Saturday and 98°F on Sunday! It does cool down to the low 60°s in the evenings, so keep that in mind as you're packing. We will be providing hot breakfast on Saturday and Sunday mornings thanks to our sponsors, and we'll have coffee available all day as well! Lunch on Sunday will be provided at Mozilla. We'll have a taco bar with gluten free, vegetarian and vegan options! Saturday lunch will be on your own at any of the nearby food carts. On Friday evening, we'll be hosting a pre-party at Pine Street Market in downtown Portland starting at 5:30pm. Pine Street Market has a variety of food and drink options, including burgers and veggie burgers, ramen, breads and pizzas, as well as Salt & Straw ice cream, excellent coffee, and fantastic cocktails. We'll have drink tickets for everyone who has registered, but anyone is welcome to come to the pre-party! Mozilla Portland is at 1120 NW Couch St. on the third floor. There will be a building security guard who will let people in in the mornings and can direct you to the right floor. The doors open at 9:00am on Saturday and Sunday. There is a streetcar that runs North/South along 10th and 11th Avenues that will drop off right at Mozilla. You can buy a ticket with a credit card at any streetcar stop, or buy a ticket with cash on board. The fare is $2. TriMet runs the buses and light rail here. The cheapest way to get into town from the airport is to take the MAX red line which picks up at the airport and drops off at Pioneer Square downtown. It's $2.50 for a 2.5 hour ticket or $5 for an all-day ticket. Your TriMet ticket will also let you ride the streetcar! We will have people participating remotely who couldn't come to Portland this year! The main room will be set up for remote participation with cameras and screen sharing. More information and the relevant links are on the wiki. As a reminder, we have a Code of Conduct that applies to IndieWeb spaces both online and offline. Since the IndieWeb Summit is hosted at Mozilla, their Community Participation Guidelines apply to this event as well. I'd like to give a shout-out to our sponsors who make all of this possible! A huge thanks to Mozilla, Bridgy, Donut.js, CSVConf, as well as our monthly supporters and everyone who contributed specifically for this event! That's all for now! Looking forward to seeing everyone on Saturday! Hi! We're so glad you registered for IndieWeb Summit this year! We're just ten days away from the fun, so here are a few things we'd like to share to make this a great event. If you haven't already, join our Slack room or IRC channel (they're connected) and introduce yourself! There is always someone there year-round, nearly 24/7, across a variety of timezones! It's never too early to start getting excited for IndieWeb Summit. The Friday before the event, we'll be hosting a pre-party at Pine Street Market in downtown Portland starting at 5:30pm. Pine Street Market has a variety of food and drink options, including burgers and veggie burgers, ramen, breads and pizzas, as well as Salt & Straw ice cream, excellent coffee, and fantastic cocktails. It's a bit too early to predict the weather next weekend, although it's looking like it will probably be warm and sunny! There's always a chance of a sudden downpour in Portland, so it doesn't hurt to come prepared.